The national debt per capita was $1,640 at the beginning of 1966, and as of October 2011, it was $48,660. 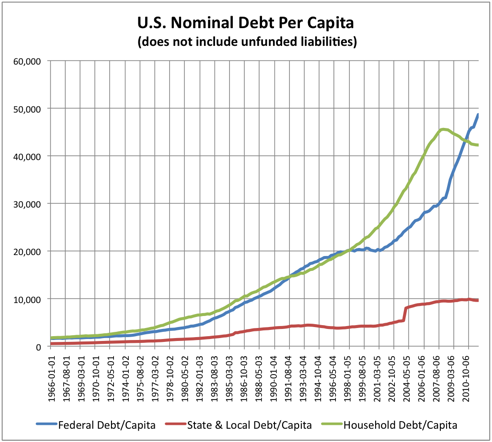 The state and local debt per capita was $535 at the beginning of 1966, and as of October 2011, it was $9,611. For household debt per capita, the beginning amount was $1,750, ending last October at $42,268. Grand total as of October 2011 was $105,589. Keep in mind that is “per capita”. On a per household basis the number is larger, and for a family of four it is over $420,000. The federal government, as well as state governments and some local governments, have massive unfunded liabilities for entitlement programs. The federal component alone, is estimated to have unfunded liabilities three times the public debt. If that is correct, the real per capita debt overhang is more like $250,000 per capita (maybe more) — $1 million for a family of four. And let’s not forget the underfunded corporate and union pensions (reportedly more than a trillion) that may become taxpayer obligations in the end. The federal debts are in short-term paper at historically low rates. They will come due at substantially higher rates, exacerbating the fiscal problems and further expanding debt. There are no signs that the federal leadership is solving the problem. They are expanding future obligations while taking credit for slowing the rate of increase of some elements in the budget (at least for now). There is simply no way these debts can be liquidated with currency at the current purchasing power. Because default can be avoided by debasing the currency, that is what will happen (along with some severe austerity as well). Most people will simply be crushed. Some will do OK and some will prosper, but most will suffer. Lenders will be losers, because they will be repaid in significantly debased currency. Beneficiaries of retirement entitlements will be losers, because caps, if not reductions will be implemented (it was mandated for Greece by Germany and France, for example — and the U.S. is not immune to such risks). The debt is beyond the ability of growth to solve the problem — unless you are talking about growth in the money supply (inflation). Disaster is not here today or tomorrow, but positioning for at least a gradual erosion of the value of contractual payment streams is appropriate. Owning natural resources and organic entities that pay cash dividends and that have the ability to adjust and adapt will be key to economic prosperity in the long-run. This entry was posted on Monday, March 26th, 2012 at 1:08 AM and is filed under Interesting Charts. You can follow any responses to this entry through the RSS 2.0 feed. Both comments and pings are currently closed.